Recognising that its users are watching more and more of its content from a mobile device, Netflix has today pushed live an update to its iOS app, improving its video player and adding more controls and enhancements. 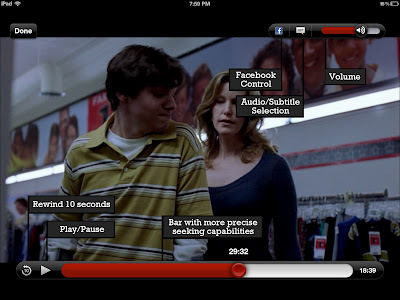 Netflix’s improved player has been given an updated look for mobile devices, which includes larger and more pronounced player controls and the addition of thumbnails to the scrub bar, making it easier to find a certain part of a film or TV show when scrubbing through content. Also included in the update is an easier way to access audio options and subtitles, as well as a toggle to enable or disable the sharing of films and TV shows to Facebook. Options have been included to limit playback to just Wi-Fi connections, reducing 3G data usage. This is possibly an option aimed for parents who allow their children to use their Netflix account and want to reduce the chances of a huge mobile bill at the end of the month. Netflix says similar features are coming to its Android app and to “stay tuned.” We will, of course, alert you the minute its Google Play counterpart goes live.